I have twice tried haggis and the first time was not a memorable experience. We had it at a local restaurant for Burns Night and frankly it was nothing to write home about. When we were in Scotland I ordered some haggis at a local pub, and what made it was the whisky sauce! This month we were challenged by the Darking Cooks’ to make haggis at home. I immediately sent an email to Tom Kitchin asking him for a recipe as there was not one for haggis in his recipe book. Levi (who works at The Kitchin) kindly emailed me Chef Kitchin’s recipe which I used as inspiration for my recipe. I do not have a local butcher that I can trust to supply me with fresh lambs lung, heart and/or stomach and so I decided to make sausages. We have a local sausage maker up the road from us and he kindly packaged some sausage casings for me to use. 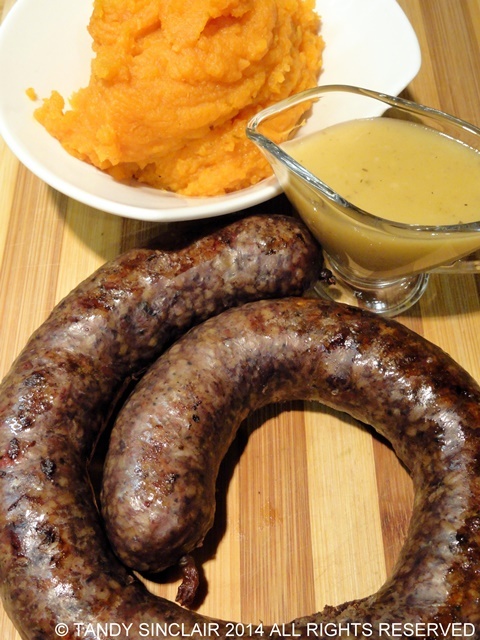 I used the ingredients listed in Jamie Oliver’s recipe in Jamie’s Great Britain (page 154) and made the most amazing tasting haggis sausages which I served with sweet potato mash and a whisky sauce. Blog-checking lines: The June Daring Cooks Challenge was hosted by Ruth from Makey-Cakey. She brought out the Daring-est of Daring Cooks and challenged us to make real Scottish Haggis. You made your own haggis,…now, I am impressed! I ate it twice on a Holiday in Scotland! 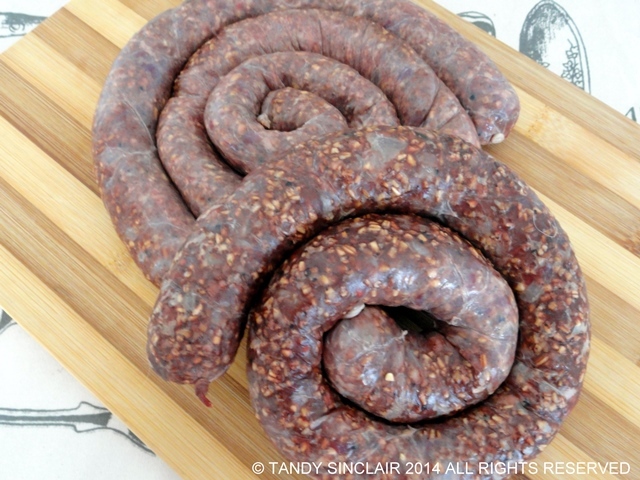 This sounds so interesting- making sausage instead of using the lamb stomach was a great idea. Very impressive – I really must make my own sausages sometime. Thank you so much Celia, I hope to make more sausages soon! I love turkey sausages and you made your own??!!! I would love to learn to make my own someday! Jamie’s the man! And you’re the girl, Tandy ;). It looks rich, spicy and flavourful! His recipes are really good! They look amazing – I love haggis! Have a Scottish pal who makes it but it is quite hard to source the ingredients. Hi Tandy, very impressive that you made your own sausage. Sounds delicious! I am SO impressed that you made your own sausages. I’m not sure I’ve ever heard of anyone doing that before! With steak and bacon, no less! I’ve had the same bad experience as you with haggis. My dad brought one back from Scotland once and stank the whole house out when he cooked it! He didn’t like it, either! I think I could ‘stomach’ (sorry) the idea much more eating haggis in sausage-form, especially if I knew as much care had been taken over making them as you clearly did! Great recipe!!! I’ve had haggis as well, and it was fine, but needed seasoning, in my mind, to actually taste good. So it’s good to see an updated version for haggis! Thanks! I’m just so impressed that you made your own haggis. I guess I haven’t (up until this point in my life) been daring enough to try such a task. But I watch a lot of Rick Steves traveling dvd’s and he loves it! Speaking of traveling, can I just say how obsessed I am over all-things-South Africa. I have an old college friend who now lives in SA for 5 years now and is so happy there. When I get in the traveling mood, I start googling travel photo’s of South Africa, it’s Table Mountain and particular that just gets me thinking. Hopefully some day I’ll get there!!! Congratulations Tandy – great effort and the sausages sound and look great. Whisky sauce also sounds delicious.